The present view of the north side of the High Street, just west of the cross-roads. 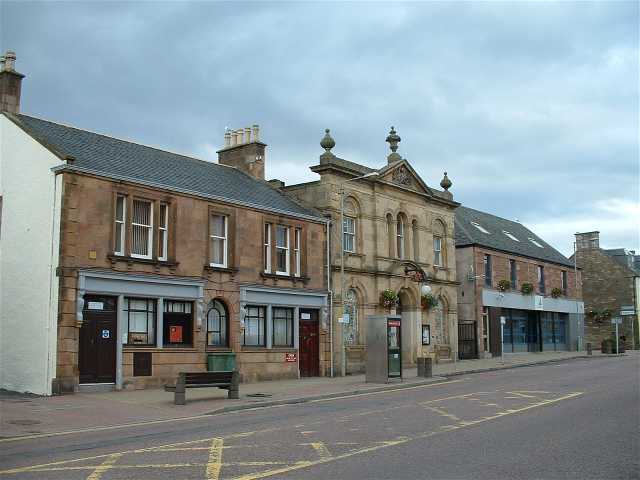 The building on the left is the Post Office sorting office; in the middle is the Arts Centre and the building on the right is occupied by the local Enterprise Company, Ross & Cromarty Enterprise. This picture can be compared directly with picture #92 and picture #283. I am glad to note that the brass post box still seems to be kept well polished. In the '50s the Postmaster was Mr Ross who lived in one of the prefabs in Joss Street. The Arts Centre used to be referred to as the Picture House but was used for concerts and dances as well as showing films. In my day it was the main place of entertainment and many couples must have met or had their first date inside. When films were shown they always played God save the King/Queen at the end of performances but as soon as the first note struck there was a stampede for the exits. I quite often picked up fleas while at the pictures. Staff tried to deal with this problem by spraying the place with insecticide before the first house. If you went in very early the (wooden) arms of the seats were still wet from the spraying. These infestations were blamed on tinkers from the little colony who lived in "bender" huts beside the Black Ditch at the back of the town. What a hard life they must have had and they were treated like lepers in the town. In regards to the Post Office, I know it has since moved. However I still get mail from Invergordon but lately all have been post-marked Inverness. My question then is do they not sort the mail anymore at Invergordon or is this another bit of progress and cost saving?